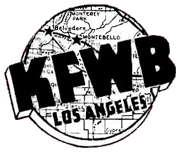 Dr. John F. Brereton, of the Altadena Hospital, is sponsoring a radio program over station KFWB. This program, "The Family Doctor," began Sunday evening, September 4, at 7:45 p. m. Filled with homey philosophy, humor, pathos, tragedy and comedy, these quarter-hour programs will prove of interest to every member of the family. Arranged through Bogardus Advertising agency of Pasadena, the program is a series of stories dealing with the problems, emergencies and happy incidents which fill the life of "Dr. Adams," the beloved "Family Doctor." The experiences which are dramatized are purely fictitious but parallel many which are familiar to every individual who has in the past known the genial, personal attention which the old time, happily recalled family doctor gave to each and every one of his patients. According to Dr. Brereton, the Altadena Hospital is the first in the United States to go on the air with its own, individual program. The attention which is given to every patient at the Altadena Hospital by the registered nurses and competent physicians and surgeons is symbolized in the program which it is sponsoring. Dr. John F. Brerton, medical director of the Altadena Hospital and sponsor of the radio program "The Family Doctor," which has been coming over Warner Brother KFWB at 7:45 each Sunday evening, announces that this program in the future will be heard over the same station on Monday at 8:45 p. m.
This change of time was made by Dr. Brerton so that his program would not conflict with any of the major coast-to-coast shows which have returned to their fall schedules. According to Dr. Brerton, countless fan letters have been received at his hospital direct and by Warner Brothers commenting on the excellent drama, "The Family Doctor." For those who have not heard their interesting program it may be said that this is a show with an all-star cast which is highly dramatic and intensely interesting. The episodes are based upon stories taken from the lives of real people. All of the scenes are laid in a small midwestern town. The family doctor who serves this community is forced to practice psychology and a kindly philosophy along with his medicine. KFWB--Christian Science, 8, 1 hr. 2:30 p.m.--W-G-N--Ray Benson's orchestra [M]. Saturday 2:30 p.m.--Family Doctor (WGN): new series about life of a general practioner." 2:30 p.m.--W-G-N--Steven Graham, Family Doctor, drama, with Bob Griffin. 2:30 p.m.--W-G-N--I Behold His Glory; 1:30 p.m.--Cancer Control show. 1:30 p.m.--W-G-N--Steven Graham, Family Doctor. 1:30 p.m.--W-G-N--This Is Jazz [M]. 1:30 p.m.--W-G-N--Steven Graham, Family Dr. [M]. 1:00 p.m.--W-G-N--Steven Graham, Doctor [M]. 1:00 p.m.--W-G-N--Steven Graham, Family Doctor employs psychological therapy and finds out why a child is starving to death. 1:00 p.m.--W-G-N--Steven Graham, Family Doctor: Dramas about psychological therapy. 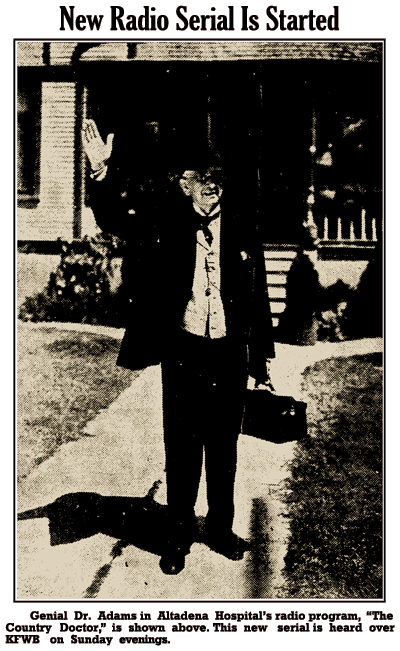 7-09-21 Chicago Daily Tribune - 1:00 p.m.--W-G-N--Steven Graham, Doctor [M]. 8 p.m.--Family Doctor (WFOW): new series: "False Witness." 8 p.m.--Family Doctor (WFOW): "Wanted--Bright Youngster." 8 p.m.--Family Doctor (WFOW): "Error in Diagnosis." 8 p.m.--Family Doctor (WFOW): "Enjoyment." 8 p.m.--Family Doctor (WFOW): "Once to Every Boy." 8 p.m.--Family Doctor (WFOW): "Cupid Without Wings." 8 p.m.--Family Doctor (WFOW): "Race With the Stork." 8 p.m.--Family Doctor (WFOW): "Secret Between Three." 8 p.m.--Family Doctor (WFOW): "Fatty Brain." 8 p.m.--Family Doctor (WFOW): "Farewell to Johnnie." 8 p.m.--Family Doctor (WFOW): "Fire Alarm." 8 p.m.--Family Doctor (WFOW): "Love Scene." 8 p.m.--Family Doctor (WFOW): "The New House." 8 p.m.--Family Doctor (WFOW): "Nature Takes Its Course." 8 p.m.--Family Doctor (WFOW): "Reconciliation." 8 p.m.--Family Doctor (WFOW): "The Prospectors." 8 p.m.--Family Doctor (WFOW): "All Bets Off." 8 p.m.--Family Doctor (WFOW): "Carnival." 8 p.m.--Family Doctor (WFOW): "The Committee Meeting." 8 p.m.--Family Doctor (WFOW): "Pete May, Ambulance Driver." 8 p.m.--Family Doctor (WFOW): "Louder Than Words." 8 p.m.--Family Doctor (WFOW): "Chick's Date." 8 p.m.--Family Doctor (WFOW): "The Beauty Contest." 8 p.m.--Family Doctor (WFOW): "The Pageant." 8 p.m.--Family Doctor (WFOW): "The Doctor Goes Shopping." 8 p.m.--Family Doctor (WFOW): "Out of Control." 8 p.m.--Family Doctor (WFOW): "The Call." 8 p.m.--Family Doctor (WFOW): "The Decision." 8 p.m.--Family Doctor (WFOW): "Farewell to Cedarton." 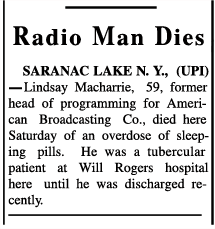 In spite of a relatively busy career in West coast Radio of the 1930s, surprisingly little is currently known about the personal and professional details of Lindsay MacHarrie's life. MacHarrie broke into Radio first at radio station KUJ, then migrated to California to work at Hollywood station KHJ in numerous capacities between 1926 and 1938. 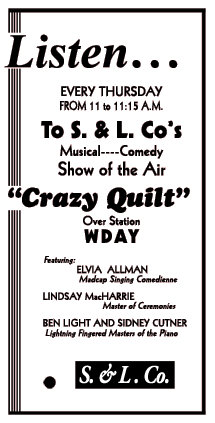 His most popular early performances over network Radio were in On With The Show (1931), California Cocktails (1933), The Rangers (1933), and the several 1934 sketch comedies of the legendary Elvia Allman, including Crazy Quilt, Komedy Kapers, The Laff Parade, and The Blue Monday Jamboree. MacHarrie later teamed up with Allman in Komedy Kingdom (1937). MacHarrie was also a member of the ensemble responsible for 1937's legendary The Cinnamon Bear Christmas serial, serving as both actor and director with a cast of what would eventually become many of Radio's Golden Age luminaries. He acted in, wrote, directed and produced mostly syndicated West Coast productions such as Can You Imagine That (1940), for which he also acted as host and narrator. He'd also appeared in nationwide programs such as Calling All Cars, Myrt and Marge, The Rudy Vallee Hour, Lux Radio Theatre, Silver Theatre, The Blue Theatre and Mayor of The Town. He took a break from civilian life during World War II, serving for two years as the Chief of the Radio Section and Secretary of Public Information for the London contingent of The American Red Cross. Upon completing his contract with The Red Cross, he returned to performing, writing directing, and producing Radio features for the American Broadcasting Company. Striken with tuberculosis, MacHarrie was in and out of hospitals during his 50s, and ultimately suffered an overdose of barbiturates shortly after being discharged from his latest hospitalization in 1960. He was reportedly despondent over the progress of his treatment regimen. MacHarrie's versatility in Radio and Telvision spanned a career of over 35 years in Broadcasting. Noted for his bell-clear voice, engaging delivery and comedic and dramatic timing MacHarrie was a popular West Coast favorite definitely marked down for even greater opportunities in Broadcasting. But bedeviled by his persistent illness, MacHarrie's premature passing was a reflection of both his impatience with his health and the effects of the extraordinary competition in early Television broadcasting. His 1940 Can You Imagine That series captures much of his on-air personality for generations to come. His promise, though regrettably never fully realized, is reflected in the over two-hundred circulating recordings that showcase his talents.